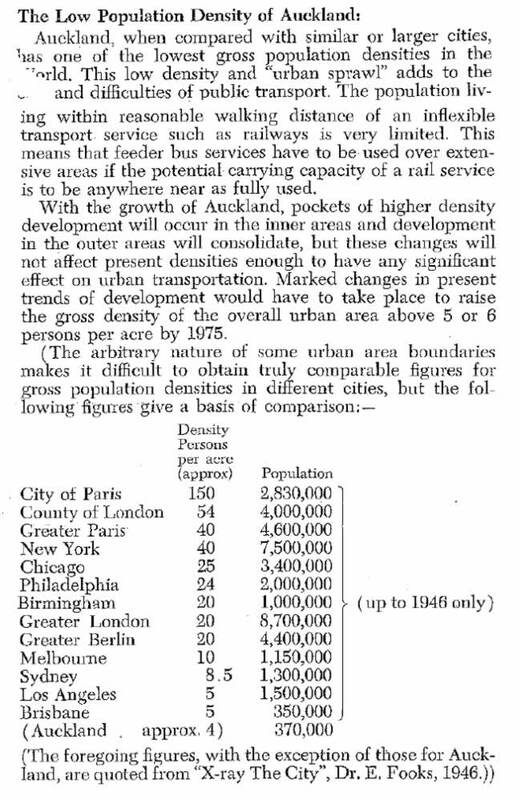 Why did the 1955 Master Transportation Plan focus so much on roads? As I explained in this previous post, the 1955 Master Transportation Plan for Auckland was a turning point in this city’s approach to transport policy. It pulled us away from the balanced approach of earlier transport plans and towards an exclusive focus on building roads. Of course as we know, it was this exclusive focus on building roads that dominated transport thinking in Auckland from 1955 right through until the last few years (and still does in some corners). However, at the time the plan was published Auckland had extremely high levels of public transport use: around 100 million PT trips a year for a city with a population of under 400,000. This is clearly illustrated below: So it is something of an interesting mystery why the authors of the Master Transportation Plan decided to push so strongly for a road-focused transport plan – and also interesting to see how they justified such an approach. The first thing I noticed reading through the plan that helps explain the issue above is a matter that we still see hugely around Auckland today: the panic over traffic congestion. 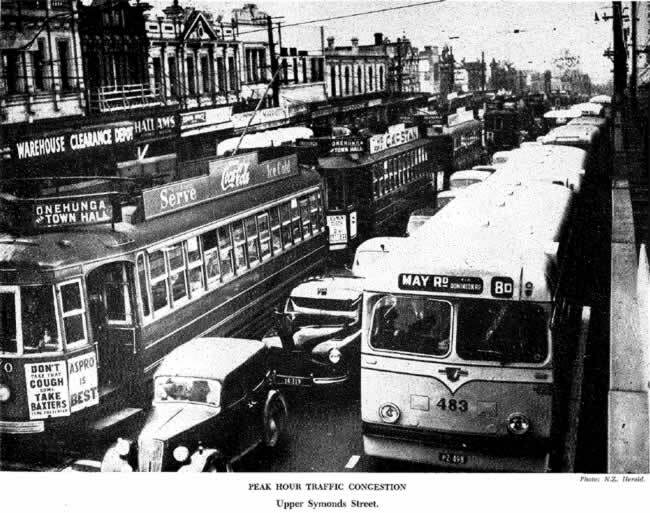 Clever photographs are included in the plan to show how congested Auckland’s streets are (and how, it seems, the cause of the congestion is actually buses and trams): The “congestion panic” is outlined in the Plan as a major reason why it’s necessary to proceed with its recommendations as soon as possible: You see rather similar cries coming out of groups like the NZ Council for Infrastructure Development today. Or from NZTA for that matter. Public transport was given some consideration – because of its ‘economy of road space’ – but was then largely written off as something of a dying breed. 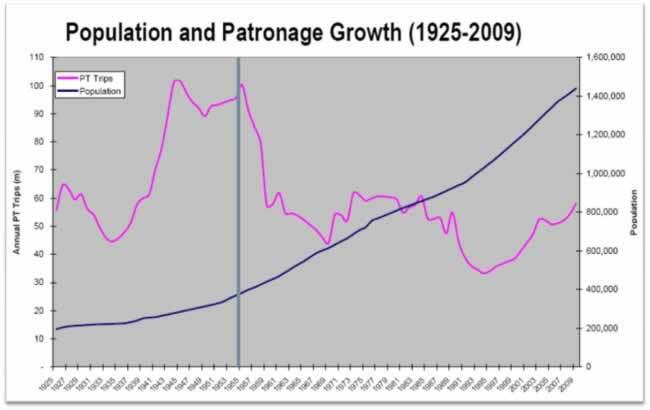 Of course PT patronage at the time had actually held steady for much of the 1950s – but soon after this plan was released (and the tram tracks were ripped up) we certainly did see a precipitous fall in patronage levels. 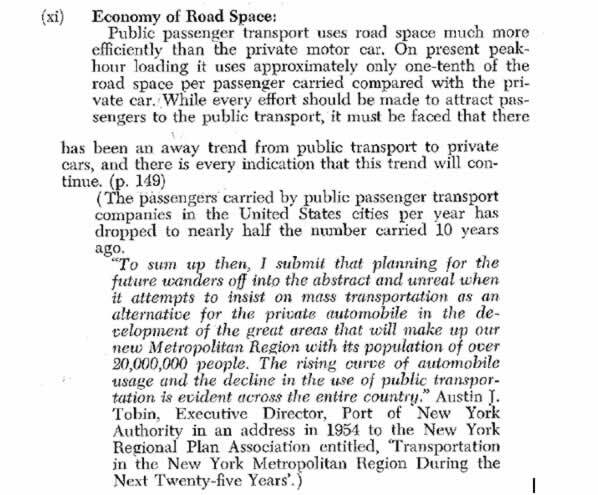 Here’s what’s said about PT in the Plan: This is another tactic that we see used today quite a lot: “oh we should try to get more people on public transport but really hardly anyone uses it so let’s focus on the important stuff of building roads”. Another major justification for the roads-focus of the Plan is once again something that we hear trotted out over and over again by opponents to better public transport in Auckland – that we’re too low density for PT to work. Paul Mees (amongst others) has criticised the data used to form this assumption (particularly as the book the figures are sourced from actually used the numbers to highlight the difficulties of calculating density based on arbitrary boundaries). 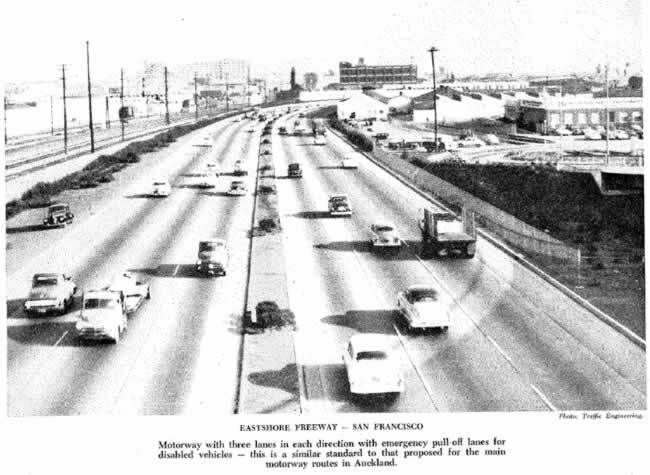 To round things off, the Plan produced photos of a number of free-flowing freeways in the USA – to contrast with the earlier pictures of highly congested streets in Auckland: Now of course some level of road development in Auckland was essential and we have benefitted significantly from aspects of the motorway system Auckland developed. Personally I think we would have been smarter to persist with the balanced approach suggested in earlier transport plans – with the motorway system focusing on trips around the city centre (for example, by building the Western Ring Route rather than spaghetti junction) while leaving an upgraded rail system to focus on the inner areas. Thereby avoiding the need for huge urban destruction to build spaghetti junction and avoiding the need to give over so much of our inner city to the car. Of course 55 years later it’s easy to pontificate ‘what might have been’ outcomes for Auckland – if this plan had been different – and for all we know things could have turned out very differently regardless of the plan. 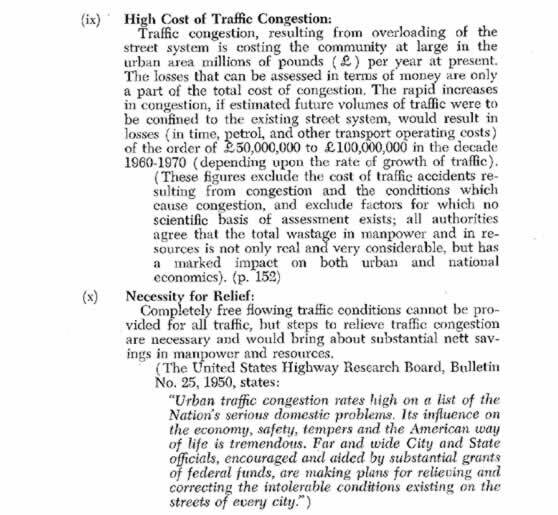 But the fact that there are so many similarities between much of the wording in the 1955 Master Transportation Plan and what we hear today from roading advocates shows, I think, that the plan has left a lasting impact. Unfortunately for Auckland, it wasn’t a particularly balanced one and transport continues to be one of the city’s biggest problems. It also shows that you cannot road build your way out of congestion… 55 years of nothing but road building, carpark construction, and the inevitable place flattening and suburb severing that goes with that and yet the road lobby just yells for more. We’ve got to get these junkies to rehab. Starting at the top, yes that’s you, Mr Joyce. Patrick – I appreciate your frequent comments indicating a dislike of Steven Joyce, the National Government, and right wingers in general, but over the last 55 years there has been a pretty good adherence to the Master Transportation Plan by successive administrations, both National, Labour and the various coalitions since 1996. For instance much of the Spaghetti Junction work of the early/mid 2000’s, the SH20 Manukau extension, most of Upper Harbour Motorway, and sections of ALPURT and the Waikato Expressway all had construction initiated under the previous Labour Government, and I can find many examples of new motorways being proposed and constructed under earlier non-National governments if you want them. For better or worse, the political system in New Zealand has alternated between National and Labour for decades with several minor parties having greater or lesser influence form time to time. This is unlikely to change in the future. The lead times of most large projects are such that they usually extend over multiple election cycles. Rather than focus on demonising an individual political figure, kiwiblog style, read the article again and note that the major point is that for over 50 years the culture around transportation in Auckland has overemphasised cars and de-emphasised PT. It isn’t really about Steven Joyce, who probably wasn’t even born in 1955. Step back and look at the big picture here. FYI – I’ve voted Labour since 1996. Not really sure what you want me to do then, is it time travel and bother politicians past? I was grumpy with Cullen when he was sitting on those surpluses and saying that old saw ‘buses need roads too’. Joyce is the road block in front of us du jour, so I take him on. Perhaps that not’s your style, hopefully you will have more success than me with whatever you do. I do constructively engage with other politicians and would with Joyce too if I believed there was any point, but alas, he’s very much unreachable with reason. Anyway the issue is clearer now than any other time in my lifetime in AK, it is fair to argue that the road age is over. The global situation as well as the local one makes Joyce’s hardline road only bias way less defensible than the more tentative road building of previous administrations. His position is more out of time. Perhaps you have another view? Or perhaps you don’t think the issue is political? I dunno, do explain. So the next question you have to ask is even though roads were in an rail out, why did a good portion of the proposed motorways never get build or even designated, eg. Eastern mwy, waterview/avondale etc. Personally I think the ‘ conspiracy against rail’ is more to do with needing to build roads anyway (you can have all the pt in the world but you still need roads) and Auckland/New Zealand never being a very wealthy place there was just not enough money to go around. Problem with that argument is NZ was one of wealthiest countires in the world when this was written. And also we already had a road network, just not a motorway system. Vancouver does pretty well without any motorways within its inner areas. My understanding is that they grossly underestimated or even deliberately omitted many of the costs when selling the ‘motorway only’ solution to the public. Admin or others can probably correct me but they budgeted something like $12m at the time to build everything but in the end that was all used up by just a few small sections and just to get a fraction of what we have ended up costing considerably more than that which is why things stalled. Had the actual costs of the motorway network been properly spelled out, even it was just the construction costs and maintenance costs, we would likely have had a very different outcome. Meanwhile, don’t park in a cycle lane in Lithuania. Knowing what was known at the time, I can’t blame them all that much. Even the word ‘freeway’ connotes so much good. More than a half century later NZTA and the Minister have no such excuses. What interests me is seeing the advertising on the trams. And I though ad-covered PT was a new thing! Just look at that picture of Symonds St. Three lanes of traffic, one lane is full of about seven buses, maybe 350 people. One lane is full of eight or nine trams, maybe 500 people. The third lane is full of about a dozen cars, or perhaps 20 people. So what’s the solution….